In Gifu, Japan, a sixteen-year-old young man was visiting a friend's house to play video games when a neighbor told them to keep it down. That's when things escalated. 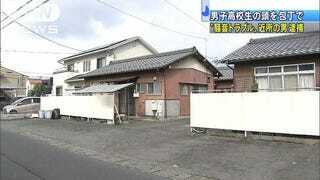 Chunichi Web reports that the sixteen-year old was up late playing video games at a friend's house. At around 2:10am, 38 year-old Shigetaka Ishimoto allegedly barged into the house while the teens were gaming. Ishimoto allegedly found a knife on the scene and stabbed the 16-year-old, who suffered a minor injury to the head. Ishimoto has since been arrested, but denied using a knife. Some Japanese houses, especially older, less expensive ones, have thin walls. In the past few months, there have been other incidents with neighbors getting angry about noise levels, leading to violent incidents. According to the police, the suspect had apparently warned the teens before to be quiet, allegedly getting angry and telling them not to play video games at night. The day of the incident, it's said Ishimoto apparently complained that the teens were being noisy, and he apparently seemed intoxicated. Glad none of the teens were seriously hurt.